Following rumors of a smartphone upgrade program from Verizon, and on the heels of T-Mobile's "Jump" initiative, AT&T said it will launch its own hardware upgrade plan in "AT&T Next." Starting July 26, customers can purchase a smartphone or tablet with no down payment, pay a monthly fee for 20 months as part of their wireless bill, and have the option trade in the device after one year to upgrade to a new hardware. Upon trading in their device, the installment cycle for that unit ends, and a new 20 months starts based on the price of the new smartphone or tablet. Alternatively, customers can opt out of upgrading and pay out the full 20 months of fees, which vary from $15 to $50, depending on make and model. 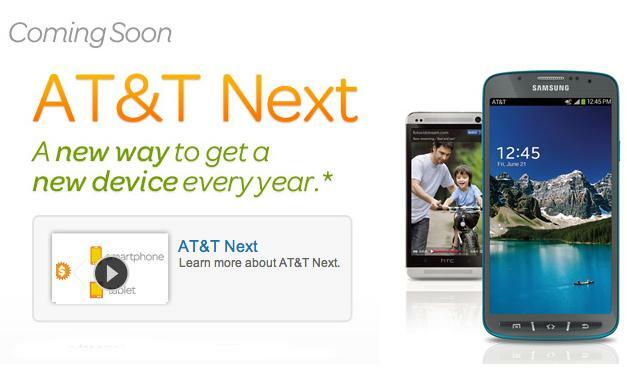 With AT&T Next, customers can get the newest smartphone or tablet every year with no down payment," said Ralph de la Vega, president and CEO of AT&T Mobility. "Thats hard to beat, and its an incredible value for customers who want the latest and greatest every year." The cost of the handset is broken down into 20 parts, thus existing or new AT&T customers can purchase a 16GB iPhone 5 and pay $32.50 per month for 12 months and trade in the unit for a next-gen iPhone model, with no further fees required beyond voice and data charges. Those who opt to pay out the 20 months' worth of fees will be able to keep the device, and there is no charge for paying off the entire amount early.